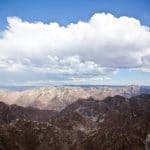 The Copper Canyon, a group of six distinct canyons of the Sierra Tarahumara in the state of Chihuahua, is formed by six rivers which empty into the Sea of Cortez, and is embraced on all sides by walls of green. 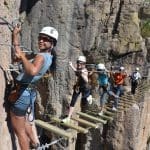 Transfer to El Fuerte, the charming colonial gateway to the Copper Canyon, founded in 1564 by the Spanish. Today, the city continues to evoke a colonial atmosphere with a city hall, main plaza, local church, and congress house. Check into your accommodation, a beautifully-restored 250-year old hacienda, which offers traditional-looking rooms with high ceilings, Mexican tiles, marble floors, hand-painted décor, and central garden patios. You’ll have the remainder of the day in which to relax and wander the cobblestone streets of this quaint, historical city. Meet your guide at 9 pm this evening in the hotel lobby for details on the next day’s departure. Take the train to San Rafael this morning, where you’ll load up the vehicle, and set out on your drive along the hills of the high sierra. Pass through the indigenous village of San Alonso, following the rolling hills of the high Sierra Tarahumara until you arrive in Guitayvo (7,590 feet) this afternoon. Settle into your communal eco-cabins, after which you’ll head out on a light hike for fresh air and impressive views of the sierra. Your first night in the mountains will be spent in these simple and charming cabins. Your hiking adventure begins today! Navigate around the mesa of Guitayvo, dropping down through an arroyo, after which you will gradually climb up the side of a canyon. The alpine region is lush and pristine, and exudes an air of mystical tranquility. In the late afternoon, you’ll arrive at the small Huemachi ranch in time for a hearty dinner. 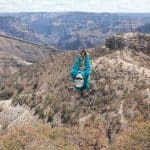 Today, continue your descent along the Urique Canyon, taking in incredible views as you walk along the ridge that spills down into the Copper Canyon. Arrive this afternoon at the Chiruhuerabo ranch, where you’ll enjoy a full, fresh dinner tonight, before heading off to rest for another full day of trekking. Today, you’ll enter the Urique Canyon proper, taking in spectacular views from the ridge, as you carefully navigate the steep descent, taking plenty of stops to observe the changing vegetation. You’ll continue your descent towards Naranjo, where you’ll be warmly welcomed by locals over coffee. Set up camp for the night among the fruit orchards in the area, where you’ll have amazing views from your tents tonight. Your final day of hiking will be shorter than the previous days’, and you’ll feel the final change in climate as you continue your descent down to the Urique River. Head to the frontier mining outpost of Urique, for a home-cooked Mexican meal with Doña Tita. By vehicle this afternoon, climb the impressive switchback out of Urique to the high sierra and your own private lodge, where clean clothes and a hot fire await. After breakfast, you’ll head towards Creel by vehicle, stopping to see the Cerocahui Mission and some of the most impressive view points in the area along the road. Enjoy lunch en route, arriving later at the frontier logging outpost-turned-tourist center of Copper Canyon, Creel. Dinner tonight is served at your cozy hotel. After breakfast, you’ll have a bit more time in which to explore the area before your mid-morning transfer to Chihuahua, where you’ll check into your comfortable accommodation at Hotel San Francisco. The late afternoon is yours in which to relax or sightsee. Chihuahua is the cultural and economic center of northwestern Mexico; once home to General Pancho Villa, the city has a number of interesting museums and historical sites to explore. After a fabulous Mexican dinner tonight, you’ll spend the night on the town for a farewell fiesta! This morning, you will be transferred to the airport in time to meet your return flight home, or to continue on to your next Willing Foot adventure.